Alexa, send up my coffee: Its here. Its real. And you need to take it seriously. Amazon’s Alexa took up the job of hotel concierge with Marriott in mid-2018. It’s done well and is now ready for consideration. At first everyone felt it would be a bit much to expect guests to use Alexa to call housekeeping. 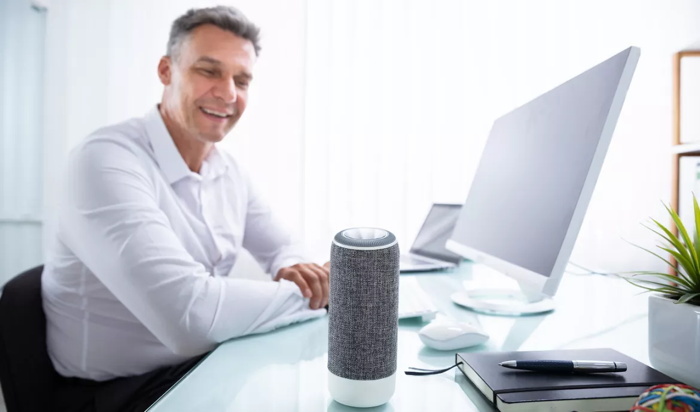 But with 65% of 25 to 49-year-olds using voice search at least once a day and 55% of the households expected to own a smart speaker device by 2022, voice is become part of consumer routine. Even when they travel. What is Alexa for Hospitality? For guests staying at Marriott, many rooms have had a minimum occupancy of two since June 2018 when the hotel chain adopted to put Amazon Echo inside to enhance guest experience. Amazon for Hospitality offers hotels and vacation rentals the opportunity to set up customised versions of Echo products that work like a digital concierge right in your room. These Echos are specialised to answer questions about your reservations, facilities such as pool or spa hours and local amenities. You can order room service or housekeeping too. Basically, anything that might lead you to dial for help on that in-room phone sounds like it will be a job that Alexa can tackle instead. Guests can benefit from Alexa’s growing skill set. And if they have their own Amazon account they’d like to use during their stay, soon they can actually log in to the device to make the experience more customised. Having done a good job at impressing guests at the Marriott, Alexa for Hospitality was invited into hotel chains such as Westin, Regis Hotels & Resorts, Autograph Collection Hotels or Aloft hotels. Alexa is powered by the Internet of Things (IOT), using machine learning to deliver an experience that is personalised. In hospitality, this means a seamless integration to a hotel’s back-office systems, housekeeping, the concierge and front desk. The Alexa for Hospitality system isn’t just the Echo devices in the room, however – it’s a suite of tools for configuring the Echo devices, available via a dashboard where hotels can update their information, enable skills, adjust settings and track usage. Hoteliers can also measure guest engagement through Alexa’s reporting and analytics platform. The system is easy to install and activate. The device is muted and activates only when a guest’s check-in and activates it for use. It automatically disconnects after every checkout. Alexa for Hospitality is customisable and with its real-time reporting enables you to take actions that will leave your guest happy. The concept of smart speakers in hotel rooms is still in its infancy, but early adopters are gaining when it comes to the best measure of a hotel’s success – guest experience. Alexa for Hospitality is now being trialled by vacation rentals such as Properly. It’s ready for the next phase in its growth, and founded on technology (voice search) that will be the next big thing in the world of internet. Are you ready for it?